For a small job, I need to design a digitally-controlled YIG preselector (a high-performance bandpass filter), for the 12.4 to 18 GHz range. The application is related to a test rig, and only 4 units are needed – at low cost, and controllable by USB. The control will be easy enough, just a programmable current source and some parameters, but first, finding a suitable YIG is quite a challenge – either only single pieces are available surplus, or they are new, and prohibitively expensive. Remembering some earlier work, I had a look at the S082-0959 – these were made by Avantek, and are available, scavenged from old spectrum analyzers, for about 200-300 USD each, and still have one spare around here. The S082-0959 is also known as YF85-0107, or HP 0960-0473 (pinout may vary). To get started, first the basics need to be figured out. 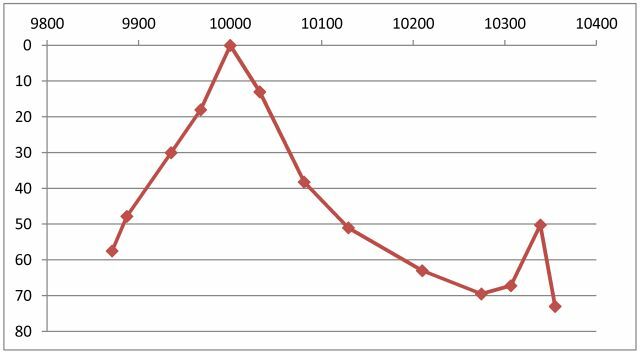 Tuning sensitivity, bandwidth roll-off (need at least 12 dB/octave; and >50 dB spurious). The thing has two pairs of connections: heater (2 wires) and coil (2 wires, this sets the magentic field – the tuning, via current – not voltage – control). Looking at some spectrum analyzer schematics – the heater needs about 28 V. And, in fact, it works well and heats up quickly, drawing about 80 mA at 28 V, less with strong coil current applied (more during heating-up). The test setup – two power supplies, a counter EIP 545A, a microwave source EIP 928, and a microwave receiver Micro-Tel 1295. Signal level was 0 dBm. The coil supply has a 4.7 Ohm current sense resistor, I’m measuring the voltage drop to calculate the current. 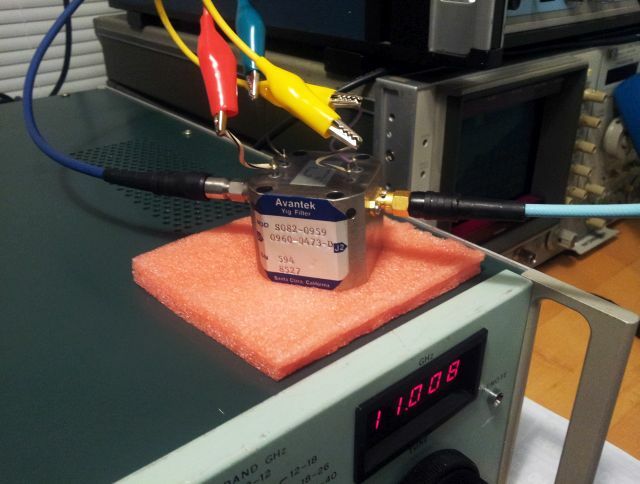 For 10 GHz, the tuning current was found to be about 132 mA, about 75.8 MHz/mA sensitivity. – note that the passband is not well captured, but 3 dB bandwidth has been measured, by manual tuning, about 25-30 MHz. Recordering accurate values is a bit troublesome, would need to phase-lock the microwave source and receiver. There is a spurious signal, about 350 MHz above the center frequency. This I will need to investigagte further. Note that the measuement points are not arbitrarily selected, but the YIG was actually tuned for the minimum loss, and the maximum response of the spurious. As you can see, when doubling the bandwidth (e.g., from 2x to 4x – don’t look to close to the center frequency), the signal is about 20 dB down. That’s close to 18 dB per octave. 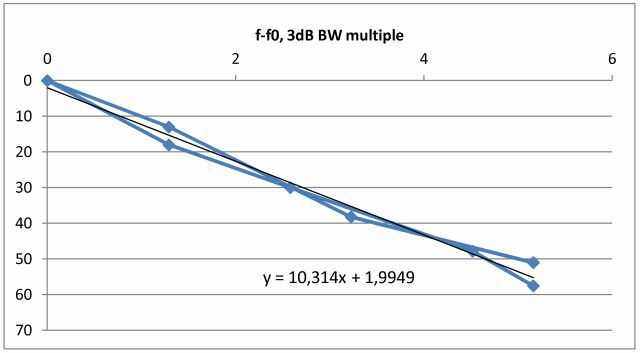 Without going into theory, which can be found elsewhere, a one-stage YIG filter will give (ideally) about 6 dB per octave. So the S082-0595 is most likely a 3 stage (3 sphere) filter. Well, limited accuaracy – the YIG will be fully characterized, once things are more advanced.